The Terraco n Foundation is a philanthropic initiative created with a goal to reach out and become a real part of the lives of employees and communities. Earlier this year, the foundation presented its National Partner Grant to the National Society of Black Engineers (NSBE) in the amount of $50,000 in support of its Summer Engineering Experience for Kids (SEEK) program. Monica Gilmore-Love, project environmental engineer in the Jackson, Miss., office, championed the grant application. She became an ardent supporter of the program after her daughter attended. 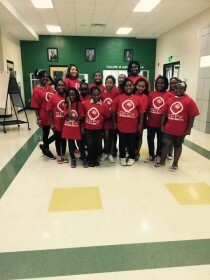 The SEEK program in Jackson took place the first week of June and included more than 100 girls in third, fourth, and fifth grades. The girls participated in fun and mentally stimulating activities that introduced them to science, technology, engineering, and math (STEM) career possibilities. The program also gave the young women an opportunity to do something different – something not typically available to them.In addition to the National Partner Grant given to the SEEK program, last year the Foundation gave $233,000 to 47 recipients in the form of community and university grants, employee dependent scholarships, and national disaster relief. For more information, visit terracon.com/about/terracon-foundation.